This sugar free living thing is certainly not black and white. And, honestly, I really like life when it is black and white. I know what to do, I follow rules, I like it when it is easy. But as I am on my third month of a “Low/No Sugar Lifestyle” I am learning that life without any sugar is no life. Life with artificial stuff is not much better than being addicted to the sugar itself. So what do we do? I am finding, that better choices – are the way. Not the right choice, because I am not sure there is a right, unless you say no sugar, and like I said, that is no way to live. So recently I went off with a group of dear friends for the Sally Clarkson conference, I knew there would be tons of sugar, and more than tons of chocolate. So, before I left, I decided that after 7 week of no sugar, that I was going to enjoy whatever that weekend. However, I also went equipped with healthy options. 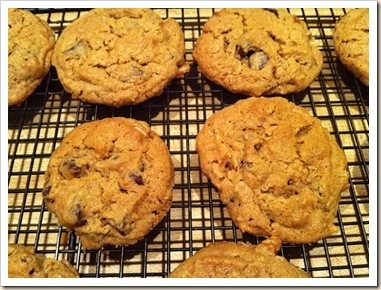 I made my own chocolate chips cookies – my favorite recipe of all time, and I modified it to get the white, refined icky stuff out. I was so happy to have my friend here when I made them, she was very experienced in sugar free baking, so she suggested options to help me out. Below is the recipe I used, I made it again tonight, since Robert will be coming home tonight after a week away. A week working out in the mornings and a week of trying to eat healthy while eating every meal out. So I wanted a reward for him when he gets here. So here is my fail-proof recipe! Enjoy! You have scaled this recipe’s ingredients to yield a new amount (72). The directions below still refer to the original recipe yield (18). In a medium bowl, cream together the butter, peanut butter, succanant, and honey. Stir in the vanilla and egg until well blended. Combine the flour, baking soda and salt; stir into the batter just until moistened. Mix in the oats and chocolate chips until evenly distributed. 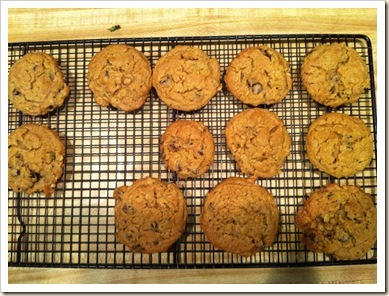 Drop by tablespoonfuls on to lightly greased cookie sheets.